The NZDUSD buyers are trying to keep control technically. Looking at the hourly chart below, the 100 hour MA (blue line) at 0.6845 has been broken in the NY afternoon session and earlier in the day (and on Friday) but each move below (see red shaded areas), the price has been reversed and moved higher. The sellers have not been able to close a bar much below the line as well. and closing below will be eyed. If those three things cannot happen, the sellers could easily give up and force the price back higher. At the highs today, the price tested the high from last week at 0.6872, and other swing level from back on Feb 26 and 27. That would be a target on more buying. 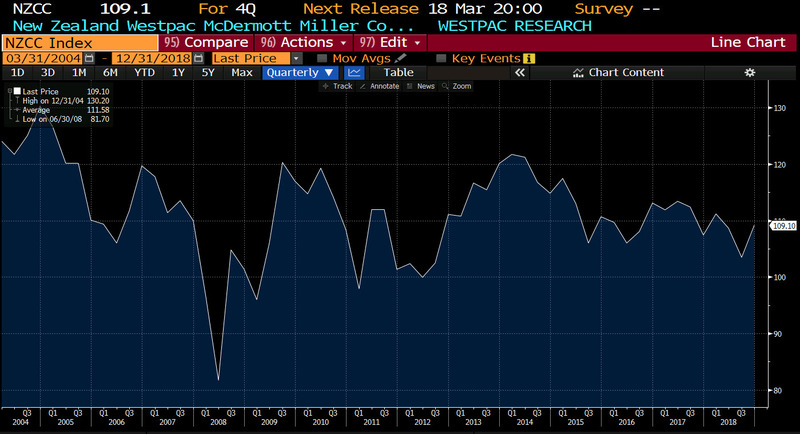 At 4 pm, Westpac will release the consumer sentiment for the 1Q. In the 4th quarter the index came in at 109.1. That was higher than the 3Q (and lowest level since 3Q of 2012).